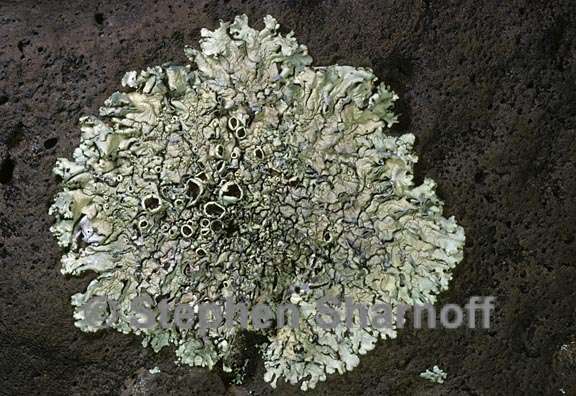 Thallus: foliose, adnate, 6-12 cm in diam., irregularly lobate lobes: primarily subirregular, less often sublinear, elongate, plane, 0.1-0.5 mm wide, separate, usually continguous, less often partially imbricate, 1-2 mm wide, sometimes becoming lobulate centrally lobulae: flat, entire, often branched; apices: subrotund, smooth to crenate, eciliate upper surface: yellow-green to sometimes bluish green, smooth, shiny, epruinose and emaculate, without isidia, soralia or pustulae medulla: white, with continuous algal layer lower surface: pale brown or brown, plane, moderately rhizinate; rhizines: pale brown, simple, 0.3-0.8 mm long Apothecia: common, substipitate, 2-10 mm wide, laminal on thallus; disc: cinnamon-brown to dark brown; margin:smooth, pruina absent asci: clavate, 8-spored ascospores: hyaline, simple, ellipsoid, 9-10 x 4-5 µm Pycnidia: common, immersed conidia: bifusiform, 5-7 x 0.5 µm Spot tests: upper cortex K+ yellow to orange, C-, KC-, P+ orange; medulla K+ yellow becoming dark red, C-, KC-, P+ orange Secondary metabolites: upper cortex with usnic acid (major); medulla with stictic acid (major) and constictic and norstictic acids (both minor) and connorstictic, cryptostictic and peristictic acids (all trace). Substrate and ecology: usually on acidic rocks but in coastal areas on soil and/or pebbles as well, often in open or partially shaded habitats World distribution: Europe, North and South America Sonoran distribution: common at intermediate to moderately high elevations in Arizona, southern California, Baja California Baja California Sur, Sonora, Chihuahua and Sinaloa. Notes: Whether the soil population of coastal California and Baja California is truly synonymous with the inland, mid to high elevation population requires further examination, as the latter population clearly corresponds with the typical circumscription of the species. Both are common. The coastal population is more loosely adnate, and has plane lobes, that are more discrete and separate and whose apices are more subtruncate.